Every restaurant wants to be fully booked this festive season. One of the best ways to bring in the big crowds is to make sure you have your veggie and vegan options covered. With a recent report suggesting one-third of UK adults had reduced or stopped their meat consumption, it’s important to keep up with trends. To help you get it right, Sam Platt, from the Vegetarian Society Cookery School has come up with a list of Top Christmas Catering Tips. Offering better veggie options will attract more group bookings. It’s common for a group to make sure the veggies and vegans will be well catered for before they book a table. If restaurants don’t improve their offering, they could lose out on not only veggie and vegan customers but their friends, colleagues and families too. Vegetarian and vegan dishes are sometimes an afterthought when restaurants are compiling their Christmas menus. This often leaves veggie customers feeling left out and unloved. Having more than one option is really important – it shows vegetarians their custom is valued. It also gives non-vegetarians plenty of great veggie options to get stuck into. When it comes to classics, my advice is – choose something else! Vegetarians and vegans have been suffering through the same dishes on almost every menu for the last several decades. Challenge yourself to do something different, and put as much work into vegetarian and vegan dishes as you would meat- and fish-based dishes. There are so many delicious ingredients and products around, great festive meat alternatives too. Consider making your own seitan roast – it’s easy to make, can be prepared in advance and is super tasty. That way, everyone feels they’re having a Christmas meal, rather than the mushroom risotto again. Vegetarian options are no longer just for vegetarians, and dairy-free options aren’t just for vegans. Many people are reducing their meat intake and joining the flexitarian trend, and eating out provides the perfect opportunity for them to try new dishes. Restaurants can lead the way with amazing veggie and plant-based food that is appealing to everyone. Chefs and managers often say they don’t have the experience and skills to be able to devise, prepare, and cook great veggie and vegan food. This is one of the reasons our professional courses, including the new vegan patisserie masterclass, are so popular at the Vegetarian Society Cookery School. We can give you the confidence to be creative with your veggie and vegan dishes. For more details or to discuss training options call the Vegetarian Society Cookery School on 0161 925 2000, or email cookery@vegsoc.org. Visit www.vegsoccookeryschool.org/professionals for more training courses. 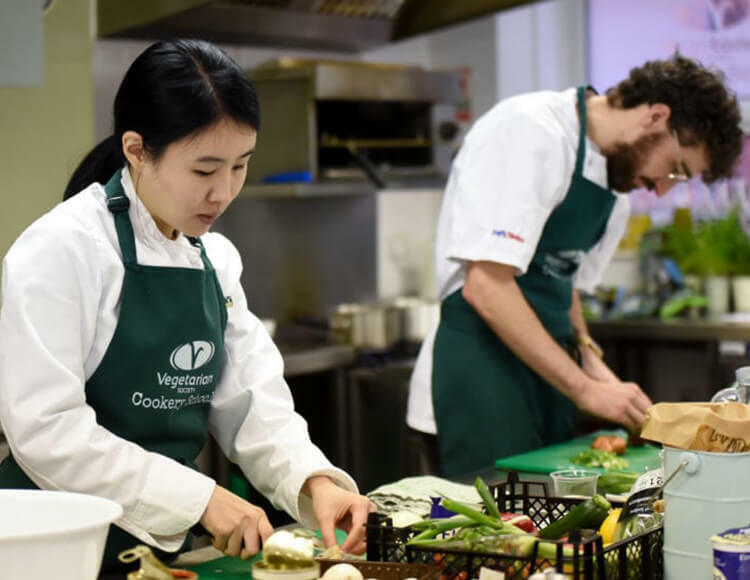 The Vegetarian Society Cookery School has trained hundreds of professional chefs and caterers. Attendees go on to improve and develop vegetarian and vegan menus in their place of work. Based in Greater Manchester, the school attracts people from all over the world.